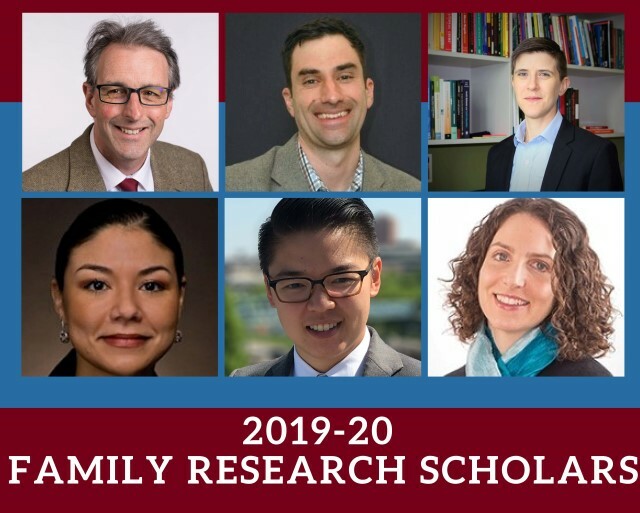 The Center for Research on Families at the University of Massachusetts Amherst is pleased to announce our class of 2019-2020 Family Research Scholars. These faculty members were selected to participate in the sixteenth cohort of the FRS Program based on their promising work in family-related research. Each academic year six faculty participate in an intensive year-long seminar that provides concrete skills for successful grant submission, peer and faculty feedback on their developing proposals, individualized methodology consultation with CRF faculty and renown experts, and guidance on funding sources. The 2019-2020 cohort represents a wide range of disciplines and research interests, including scholars from four schools and colleges across campus--Social & Behavioral Sciences, Natural Sciences, Education, and Public Health and Health Sciences in the departments of Communication, Psychological and Brain Sciences, International Education, Biostatistics and Epidemiology, and Health Promotion and Policy. Dr. Barron’s study aims to evaluate the efficacy of Progressive Counting (PC), for addressing childhood trauma, a novel and promising trauma therapy that uniquely integrates cognitive behavioral and brief-exposure approaches. Identifying effective therapies for detained youth offers the promise of breaking the cycle of transgenerational trauma and facilitating resilience at individual, familial, and community levels. Dr. Grabell’s study will test whether data collected from wearable and contactless devices can be used to detect child tantrums that indicate risk for mental disorder and predict the onset of a tantrum before it occurs in real time. The proposed study has the potential to move the field toward a future of artificial intelligence-assisted, home-based, early mental health detection and treatment. Devon Greyson, PhD, Assistant Professor, Communication, School of Social and Behavioral SciencesDr. Greyson’s study aims to understand how pregnant individuals make cannabis-use decisions amidst medical uncertainty, and how cultures, communities, and governments affect that decision-making process. The results will help clinical and public health professionals to better communicate with the public about the potential risks and benefits of cannabis use in pregnancy and lactation. Dr. Martínez plans to examine the relationship between chronic psychosocial stressors and physiological stress, on salivary uric acid, a biomarker for oxidative stress, among Latinx families of different migrant family structures. The study hopes to demonstrate the consequences of parents’ legal vulnerabilities for children’s physical health. She hopes that her research can reverse policies excluding US immigrant populations and inform community-based prevention strategies. Dr. VanKim’s goal is to develop a better understanding of how exposure to discrimination, stigma, and bias, on the basis of one’s sexual orientation, may increase risk in developing type 2 diabetes. Specifically, she is interested in studying the potential mechanisms that contribute to sexual orientation disparities in type 2 diabetes among women; these potential mechanisms may be higher levels of cortisol and insulin resistance that exacerbate risk for type 2 diabetes among LGBT individuals. Dr. Whitehill proposes to identify associations between state policies, community factors, and individual factors and drug-involved motor vehicle crashes (MVC). Her study will provide a comprehensive look at the problem of drug- and polysubstance-involved MVCs in the U.S. and yield insights relevant to policymakers and public health advocates seeking to reduce the burden of drug-impaired driving on individuals, families, and society. CRF is an endowed interdisciplinary research center of the UMass Amherst College of Natural Sciences and the College of Social and Behavioral Sciences. CRF’s programs provide lectures and consultation from national experts, methodological training and expertise, grant-writing support and research funding to faculty and students from these diverse backgrounds at all stages of their academic careers. CRF is committed to investing in each faculty member and student’s research career for the long term. For more information on the Family Research Scholars Program or the Center for Research on Families, please contact Associate Director Gisele Litalien at glitalien@umass.edu or (413) 545-2335.